It’s not every day that you get trained in exorcism. Not that I felt I needed that much training. I have recounted some (but by no means all) of the stories of encounters that I have had with both the more troublesome and ill-intentioned spirits that inhabit the subtle and invisible realms. Regular readers and clients will testify to that. Nevertheless, I was “accompanying a minor”. My wife, M, is learning about energy healing and as a off-shoot, an adjunct and a bolt-on to the course two experienced practitioners, Dan Khan and Mimi McNally, were offering a day’s tuition on Entities, Exorcism and Energetic Protection. It would take place under the banner of The Lightning Path at the Regent’s Park University in London too – a beautiful building next to the park itself. Sold. I have also recently developed on the same subject, but with a different focus. My course is designed to offer some very practical methods to deal with such issues. There is time in my course to learn, practise and develop techniques over a number of weeks. The Lightning Path course was different – it was a one-day crash course that touched every topic it could in as much depth as possible in the time available. I have to say – they did an incredible job considering the restrictions! Clearly competent teachers whose approaches blended perfectly, they guided us through gently, carefully, but at breakneck speed into the world of ” unknown intentions“. Their emphasis was mainly on how malevolence, frustration and deceit could be transformed through an energetic shift from dark to light, dense to dispersed, and low to high vibration. During a meditation we were asked to visualise a shelf on which are some objects are placed. These objects symbolised our protection. 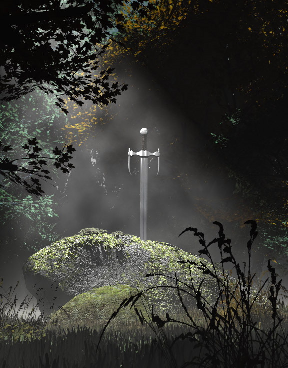 As I journeyed into the darkness of the creative space, images began to form in front of me: I saw a sword and a stone. At the time I didn’t see the relevance to anything past or present. On reflection afterwards I remembered my “sword and shield” protection mechanism from years ago. 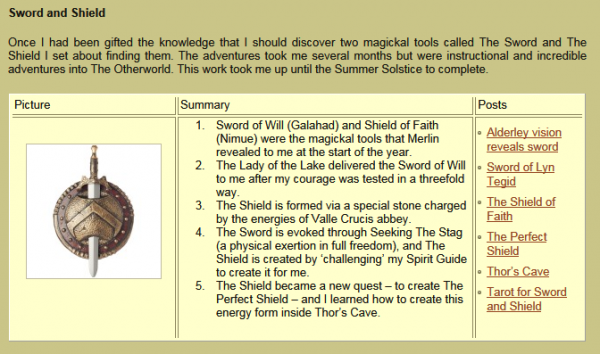 a) The Sword and Shield psychic protection was physically represented as a wand and a stone (with a cross of veined crystal). The wand was wielded like a sword. The Sword of Will and the Shield of Faith. b) The Sword In The Stone. All those associations with Arthurian mythology. The two symbols of sword and stone relate to the Arthurian archetypes that I have worked with, particularly Merlin and Arthur. Funny how these things emerge, even from somewhere deep!